Alaska Airlines (Seattle/Tacoma) today announced two new routes from Los Angeles, and one new route from Boise, Idaho. 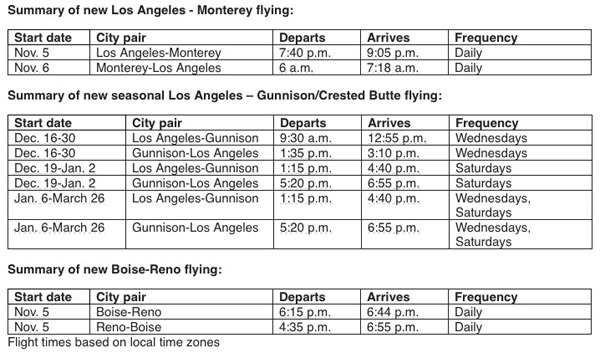 New daily roundtrip service between Los Angeles and Monterey, California; and Boise, Idaho and Reno, Nevada begin November 5. 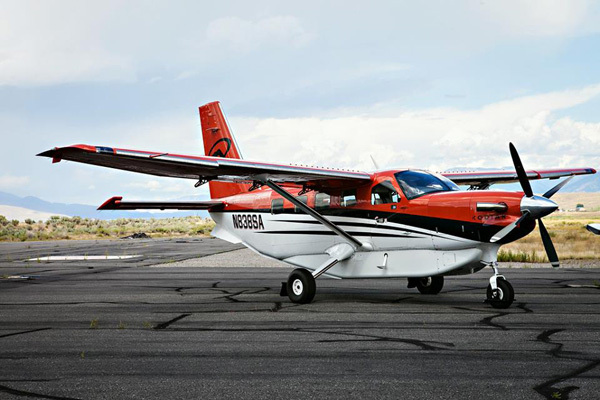 A new seasonal flight between Los Angeles and Gunnison/Crested Butte will shuttle skiers and snowboarders from California to Colorado starting in December. The flights will be operated by Alaska’s sister carrier Horizon Air (Alaska Horizon) (Seattle/Tacoma), using the pictured 76-seat Bombardier DHC-8-402 (Q400) aircraft. Alaska also announced today that it will upgauge its flights from Los Angeles to Loreto, Mexico, beginning November 1. The flights are currently operated daily, using 76-seat Bombardier Q400 aircraft. Beginning in November, they will be operated Thursday-Sunday using Boeing 737 jets, adding about 70 additional seats each week. Copyright Photo: Ken Petersen/AirlinersGallery.com. Horizon Air, operating as Alaska Horizon, operates its Bombardier DHC-8-402 (Q400) turboprops from its Seattle hub and now in Alaska. Bombardier DHC-8-402 (Q400) N441QX (msn 4348) in the University of Alaska Nanooks (Fairbanks) departs from Ted Steven Anchorage International Airport (ANC). 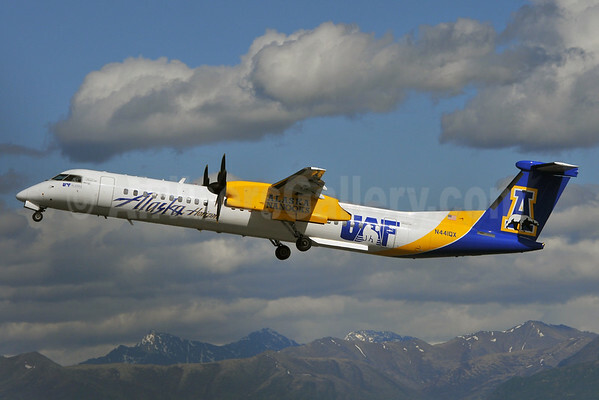 This entry was posted in Alaska Airlines, Alaska Horizon, Horizon Air and tagged 4348, Alaska Airlines, Alaska Horizon, Alaska Nanooks, Boise, Bombardier, Bombardier DHC-8, Bombardier DHC-8-400, Bombardier Q400, DHC-8, DHC-8-400, DHC-8-402, Gunnison/Crested Butte, Horizon Air, Loreto, Los Angeles, Monterey, N441QX, Q400, Reno, University of Alaska on June 30, 2015 by Bruce Drum. Allegiant Air (Las Vegas) flight 331 from Los Angeles to Boise, Idaho with McDonnell Douglas DC-9-82 (MD-82) N423NV (msn 53008) on Friday evening (June 12) was delayed somewhat in arriving at BOI when a fuel leak developed in the auxiliary power unit while taxiing to the gate. Passengers smelled fuel and when the flight stopped at the gate, passengers opened an emergency exit over the wing and tried to exit via the wing. There were no injuries. This entry was posted in Allegiant Air and tagged Allegiant Air, BOI, Boise, flight 331 on June 14, 2015 by Bruce Drum. Alaska Airlines (Seattle/Tacoma) will begin daily nonstop service between Boise, Idaho and Spokane, Washington, starting August 24, 2015. With the addition of Spokane, Alaska Airlines now flies to eight destinations from Boise: Lewiston, Idaho, Portland, Oregon, Sacramento, Salt Lake City, San Diego, San Jose, California, Seattle/Tacoma and Spokane. The new flight, which is just under 70 minutes, will be operated by Horizon Air (Alaska Horizon) (Seattle/Tacoma) for Alaska Airlines using 76-seat Bombardier DHC-8-402 (Q400) aircraft. Copyright Photo: Michael B. Ing/AirlinersGallery.com. Alaska Horizon (Horizon Air) Bombardier DHC-8-402 (Q400) N422QX (msn 4150) climbs away from the runway at Seattle-Tacoma International Airport (SEA). 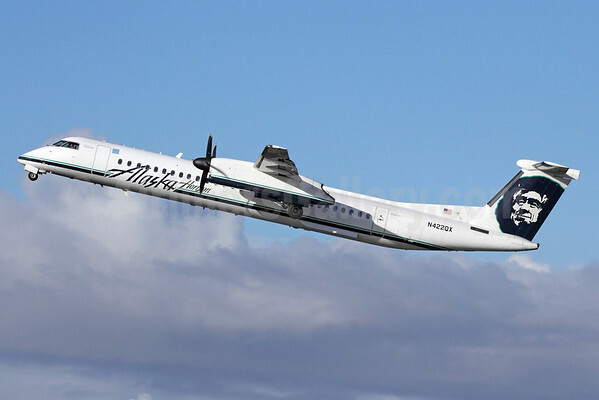 This entry was posted in Alaska Airlines, Alaska Horizon, Horizon Air and tagged 4150, Alaska Airlines, Alaska Horizon, Boise, Bombardier, Bombardier DHC-8-100, Bombardier DHC-8-200, Bombardier DHC-8-400, Bombardier Q400, DHC-8, DHC-8-402, Horizon Air, N422QX, Q400, SEA, seattle tacoma international airport, Seattle/Tacoma, Spokane, Washington on March 19, 2015 by Bruce Drum. Delta Air Lines (Atlanta) will launch daily nonstop service next spring from Seattle-Tacoma International Airport to five new destinations in the continued expansion of its West Coast hub. Delta will serve the top 15 destinations in the Western U.S. with the addition of Boise, Denver and Sacramento, while Ketchikan and Sitka complete the top five destinations in Alaska. Delta will also increase its number of daily flights from Seattle/Tacoma to Anchorage, Alaska; Atlanta; Calgary, Alberta; Detroit; Los Angeles; San Francisco and Salt Lake City. On December 20, Delta will begin service from Seattle/Tacoma to several sun and ski destinations, including Bozeman, Mont. **; Maui, Hawaii; Palm Springs, Calif.**; Phoenix**; Puerto Vallarta, Mexico; and Tucson, Ariz.*; as well as a second daily flight to Honolulu. Additionally, Delta commenced service to Calgary** and Spokane, Wash.* **, at the beginning of November. Delta currently operates 80 peak-day departures to 25 destinations from Seattle and will increase to 93 peak-day departures to 32 destinations in December. By next summer, Delta will offer 120 peak-day departures to 35 destinations. The new routes will allow customers to seamlessly connect to Delta’s ten long-haul international flights from Seattle, while providing compelling travel options to cities important to local customers. Earlier this year, Delta launched international service to London-Heathrow, as well as Seoul and Hong Kong and now provides more international long-haul service from Seattle than all other airlines combined. This includes the top five destinations in Asia and three of the top four destinations in Europe. Delta is the only carrier to offer nonstop service from Seattle to Amsterdam, Hong Kong, Paris, Shanghai and Tokyo-Haneda. Copyright Photo: Bruce Drum/AirlinersGallery.com. 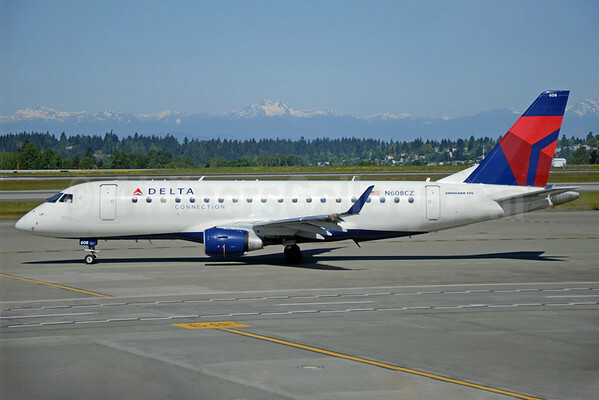 Compass Airlines is already operating several routes at SeaTac as a Delta Connection carrier with its Embraer 175s. ERJ 170-200LR N608CZ (msn 17000195) taxies to the runway at SEA. This entry was posted in Compass Airlines, Delta Air Lines, Delta Connection, SkyWest Airlines and tagged 17000195, Boise, Compass Airlines, Delta Air Lines, Delta Connection, Denver, Embraer, Embraer 175, Embraer ERJ 170, Embraer ERJ 175, ERJ 170, ERJ 170-200, ERJ 170-200LR, ERJ 175, Ketchikan, N608CZ, Sacramento, SEA, Seattle, seattle tacoma international airport, Seattle/Tacoma, Sitka, SkyWest Airlines on November 20, 2014 by Bruce Drum. United Airlines (Chicago) will add additional Embraer 175 flights from the San Francisco hub in the fall. In addition to the previously-reported routes, United will add United Express service from SFO with the new E175 flights to Boise (starting on September 30), Calgary (September 21), Dallas/Fort Worth (October 26), Kansas City (October 26), St. Louis (September 20) and Salt Lake City (October 26) per Airline Route. The SFO flights are expected to be operated by SkyWest Airlines. Within the next two years, SkyWest will take delivery of 40 new E175s that will operate under an agreement with United Airlines. From Houston, E175 service on flights between the hub at George Bush Intercontinental Airport and Atlanta and New Orleans begins on June 15, and between Houston and Austin starting on June 16. 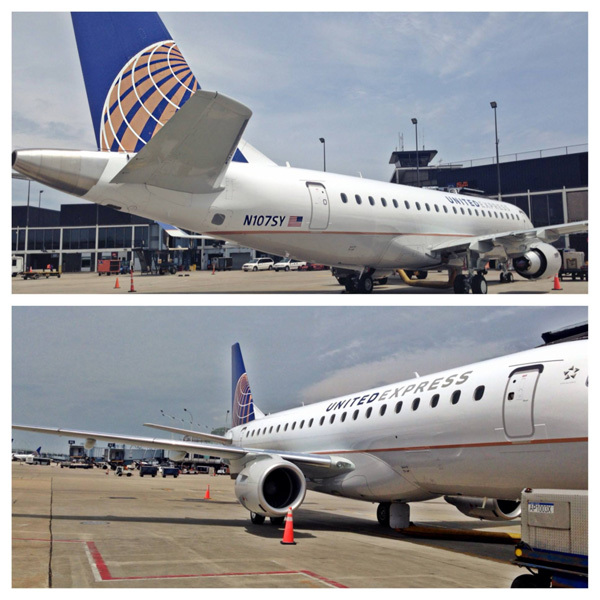 United also launched E175 service between Chicago O’Hare and Minneapolis/St. Paul on June 5; between Chicago O’Hare and Atlanta beginning on June 15; and between Chicago O’Hare and New York LaGuardia beginning on June 23. United Express carrier Mesa Airlines will operate the flights between Houston and Atlanta, Austin and New Orleans. United Express carrier SkyWest Airlines will operate the flights between Chicago and Atlanta, New York LaGuardia and Minneapolis/St. Paul. This entry was posted in Mesa Airlines, SkyWest Airlines, United Airlines, United Express and tagged Boise, Calgary, Dallas/Fort Worth, Embraer, Embraer 175, Embraer ERJ 175, ERJ 175, Kansas City, Mesa Airlines, salt lake city, San Francisco, SkyWest, SkyWest Airlines, St. Louis, United Airlines, United Express on June 12, 2014 by Bruce Drum. 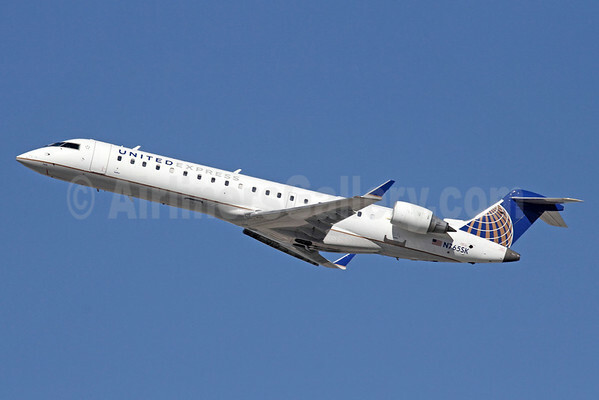 United Airlines (Chicago) will introduced a new daily Bombardier CRJ700 route from the Houston (Bush Intercontinental) hub and Boise, Idaho starting on August 19 per Airline Route. Copyright Photo: Michael B. Ing/Airlinersgallery.com. Bombardier CRJ700 (CL-600-2C10) N765SK (msn 10231) of SkyWest Airlines climbs away from Los Angeles International Airport. This entry was posted in United Airlines, United Express and tagged 10231, Boise, Bombardier, Bombardier CL-600-2C10, Bombardier CRJ700, CL-600-2C10, CRJ700, Houston, Idaho, LAX, Los Angeles, N765SK, SkyWest Airlines, United Airlines, United Express on April 15, 2014 by Bruce Drum.